This was originally Cleo’s idea ‘“ see Cleopatra Loves Books. It’s to look back over your reviews of the past five years and pick out your favourite for each month from 2011 ‘“ 2015. I really enjoy looking back over the books I’ve loved reading. These are my favourite books for each June from 2011 to 2015 (click on the covers to see my original reviews). Titus Groan by Mervyn Peake. Sometimes it’s dangerous to re-read a book you loved the first time round. There’s always the possibility that you’re going to be disappointed that it wouldn’t live up to to your expectations, especially if the first time you read it was whilst you were in your teens. With Titus Groan I needn’t have worried. I thought it was fantastic the first time and absolutely fantastic when I re-read it in 2011. The world Peake created in Gormenghast is real on its own terms. It has history, culture and its own rituals and traditions. The novel is poetical, rich in imagination, description and characters. It all came alive as I read on and the same magic I felt the first time was still there. The Secret River by Kate Grenville – a dramatic and vivid story. This is historical fiction, straight-forward story-telling following William Thornhill from his childhood in the slums of London to Australia. He was a Thames waterman transported for stealing timber; his wife, Sal and child went with him and together they make a new life for themselves. It’s about struggle for survival as William is eventually pardoned and becomes a waterman on the Hawkesbury River and then a settler with his own land and servants. It raises several issues ‘“ about crime and punishment, about landownership, defence of property, power, class and colonisation. Kissing the Gunner’s Daughter by Ruth Rendell. This was first published in 1992 and I’d owned for over 20 years before I read it – I wished I’d got round to it earlier, but it was well worth the wait. It’s an Inspector Wexford murder mystery, full of red herrings; an excellent book, both for the mystery element and for the characterisation, even the lesser characters stand out as real people. I had my suspicions quite early on in the book about the murder, but it was only intuition ‘“ I couldn’t put my finger on the reason for my thoughts. Sisters of Sinai by Janet Soskice, a biography of twin sisters, who in the latter half of the nineteenth century, travelled to St Catherine’s Monastery at Mount Sinai where they discovered one of the earliest copies of the Gospels written in ancient Syriac. Their father died when the twins were 23 leaving his fortune to them and they decided to have a trip down the Nile. And that was just the beginning; their lives were transformed. They learnt Greek, Arabic, Hebrew and Syriac, returning to Egypt and Sinai many times, befriending the monks of St Catherine, despite their religious differences, and getting embroiled in disputes with Cambridge academics. An enthralling book about two courageous and enterprising women. 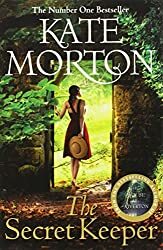 I read so many good books this month it should have been hard choosing a favourite, because I loved all the Jane Casey books and the Agatha Christie book I read, but The Secret Keeper by Kate Morton surpassed them all. I loved everything about this book’“ the descriptive passages, the mystery, the secrets and the characters involved. It begins on a summer’s day in 1961 in Suffolk when sixteen-year old Laurel is shocked when she sees her mother, Dorothy, stabbing a stranger who had come to their farm. It’s a story moving between time periods from 2011, back to the 1960s and also to the 1940s as Laurel discovers the secrets about Dorothy’s life. It really is a book I didn’t want to put down and also a book I wanted to enjoy as long as possible. By the end, though, I couldn’t turn the pages fast enough! You’ve chosen two of my favourite books, Sisters of Sinai and The Secret River. And I’ll keep an eye out for The Secret Keeper. Interesting bunch again this month! I think the biography appeals most to me this time – they sound like amazing women. Kissing The Gunner’s Daughter is one of the Ruth Rendell books I recall as a favourite, too. Her Barbara Vine books were fantastic, though. Always fun to see other folks’ favorites! I looked up and found my library has the Kate Grenville one… so that will be one of my summer reads! Some interesting choices. I have no idea how I’d pick… although I can probably name 2-3 off the top of my head I’d struggle with others. Incidentally the 2-3 would be: Room (Emma Donoghue) and When the Night Comes (Favel Parrett). what great taste in books you have!! Titus Groan is such a good book! I’m nervous about re-reading favourites, but I’m sure Peake would stand up to it! The Secret River is another of my favourites, but I haven’t read the others. I’m easpecially intrigued by The Sisters of SInai – thanks for drawing it to my attention!